Food is very important to us all at Knockendarroch and we do everything we can to make your restaurant experiences with us as good as possible. Our style makes for a relaxed, contemporary dining experience. Great food and attentive service delivered with a friendly and light touch. Florina and Violet will look after you in the lounge with pre-dinner drinks and canapés before taking you through to the restaurant when your starters are ready. Our Head Chef, Nick Imrie, has been cooking at Knockendarroch since 2016. His modern Scottish menus change every day use seasonal and locally sourced ingredients where appropriate. Each evening he offers a choice of four starters, four mains and four desserts. There is always a vegetarian option available and special dietary requirements can be catered for with a little notice. 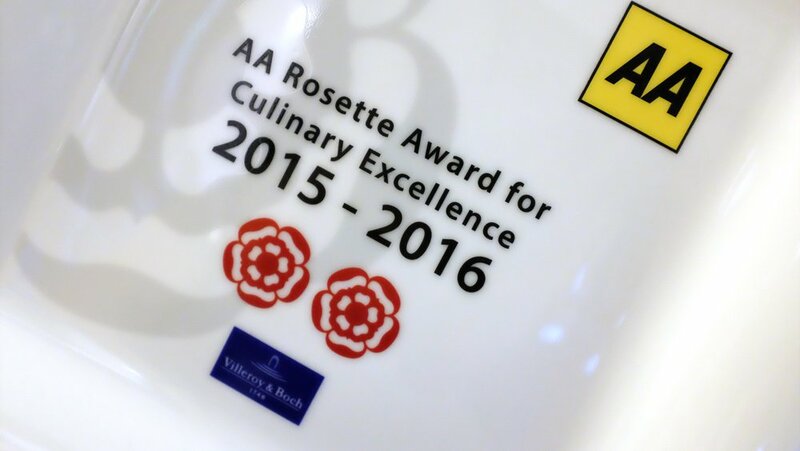 The AA have awarded the Restaurant at Knockendarroch two red rosettes since 2014. Due to the compact nature of our restaurant and kitchen the largest booking we can accommodate is for six guests (and only for resident guests of the hotel). Please see below for details of non-resident dining options. Please note: we do not serve lunches in the restaurant. A light snack menu is available in the lounge for residents. Check out our short time lapse video below to get a feel for a day in the kitchen at Knockendarroch. 10 hours of prep and service condensed into a 2 minute video. It's a small kitchen, but it's very busy! Pre-theatre restaurant times are available and complimentary theatre transport can be provided for residents during the theatre summer season. Our full three course menu applies. Please note: complimentary transport is only available those residents who book directly with the hotel on a dinner, bed and breakfast basis. Non-residents are most welcome to dine in the Restaurant at Knockendarroch. The menu is priced at £46 per person for three courses and canapes. Booking is essential and dietary requirements and allergies must be advised in advance. Due to the compact nature of the restaurant there are times when tables may be extremely limited. A maximum table size of two is likely. Please call to make a reservation. Breakfast at Knockendarroch is equally important to us and we think you will enjoy our traditional Scottish offering. Amongst other options you can choose from porridge topped with brown sugar, cream & whisky, home-made granola, traditional eggs Benedict or a full Scottish breakfast with haggis and home-made potato scone. Good news! The Restaurant has retained 2 AA Red Rosettes for 2019. Well done to all involved in both the kitchen and front of house.